Reverend Susan Grittman at Highlands United Methodist Church in Highlands, TX just recently had an Advantage LED faux monument sign installed at their church. She says her church is a multi-generational church that incorporates the community, and they're already seeing an increase in worship since the installation of the Church Sign. Reverend Susan Grittman at Highlands United Methodist Church in Highlands, TX just recently had an Advantage LED Signs faux monument sign installed at their church. She says her church is a multi-generational church that incorporates the community, and that they’re already seeing an increase in worship since the installation of the Church Sign. She says it’s a community of people, and that the church itself is just a warm and accepting atmosphere. Until the installation of the LED Church sign many people that had lived in the town their entire lives didn’t even realize the church was there. It sits back a ways from Main Street and is a bit hard to find. She said when she first drove up she thought the church needed a sign off Main Street, and then she later learned after sitting down with the board of Trustees of their hopes of installing a sign and driveway from Main Street. At first the funding wasn’t there, but after a donation they were able to install the Church sign. When they went to choose a sign company they wanted one that could create a monument. Something that was somewhat traditional and contemporary, yet also incorporating an LED sign. When she googled it Advantage LED Signs came up, and their pricing was very competitive. She stated that she knew she made a good choice, because they have a really good product. There was guidance with some examples of Church signs, and they felt like they’d been working with Churches before, so they’d be able to guide them. After they got the LED Church sign up the training went very smoothly; the three of them sat down at the computer and the trainer set everything up for them very well with good support all through the training. Reverend Grittman also wanted the sign so that people would feel welcome. She was at the Bank and somebody said, ‘I saw your sign, it’s gorgeous!’ It just looks so welcoming, it just opened everything up. 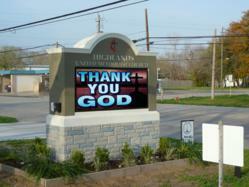 Worship attendance has increased and, people are just talking about the new LED sign. The Chamber of Commerce said it makes the whole Main Street look beautiful. If other businesses or churches are thinking about using Advantage LED I’d recommend for them to call me because we can talk about the process and the questions they might want to ask. It helps with someone that’s been through it before.